Why are parents paying hundreds of dollars for this doll? It’s the doll that offers the possibility of a peaceful night’s sleep for babies and parents – and they’re willing to fork out big bucks to give it a go. 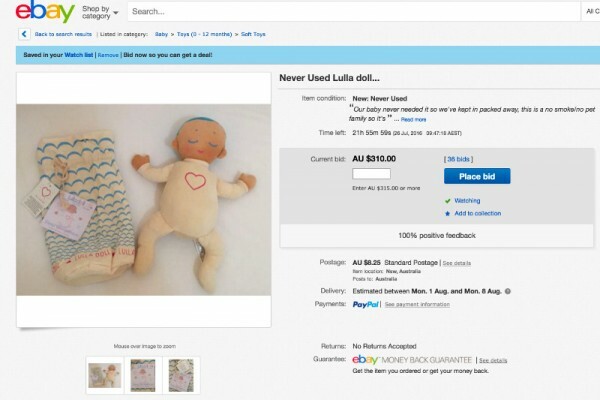 Australian mums are paying up to four times the $100 price tag just to get their hands on a sold-out Lulla Doll – which plays a recording of a mother’s heartbeat and breathing. The Lulla Doll was originally a crowdfunding project, limited to 5000 dolls which were sold around the world, including Australia. Once those 5000 units were exhausted, mothers began searching selling sites for Lulla Dolls – and a quick search on eBay uncovers dozens currently up for auction. Second-hand and new Lulla Dolls are selling for more than $300. So, what makes them so appealing? According to Icelandic company RoRo Care, which created the dolls, they imitate the closeness a baby feels with its mother, through soft materials and the real-life heartbeat and breathing recordings. The dolls appeal to all senses, with the face created to be gender and race neutral, and the fabric of the doll able to absorb a mother’s smell if she keeps it close to her skin before giving it to her baby. Roro has been taking pre-orders for Lulla Dolls, and a second rollout was due late last month, but as yet Australian retailers are still reporting they are without stock. If you’re willing to wait until August, you can snap up a Lulla Doll on Indiegogo for US$71.